Thanks to the success of my Patreon campaign, I was finally able to buy myself the Canon 80D — a camera that I have long thought about. After all, I have been using the Canon T4i (watch my unboxing) for more than four years. In the world of technology, that can feel like a lifetime. Needless to say, I was definitely due for an upgrade. But to make my Canon 80D purchase a little more interesting, I thought I would try something different. Why not opt for a bundle and save some money in the process? Doing so would also allow me to get my hands on a variety of accessories that I would normally not buy. Well, that's just what I did. Considering everything that came bundled with the Canon 80D, I am more than happy to have paid $1,399. But what exactly is included? Obviously there's a large number of accessories in the image above, and not all of them are necessary, but some are certainly worth your attention. Below is a list of each item included in the bundle and its proposed purpose. 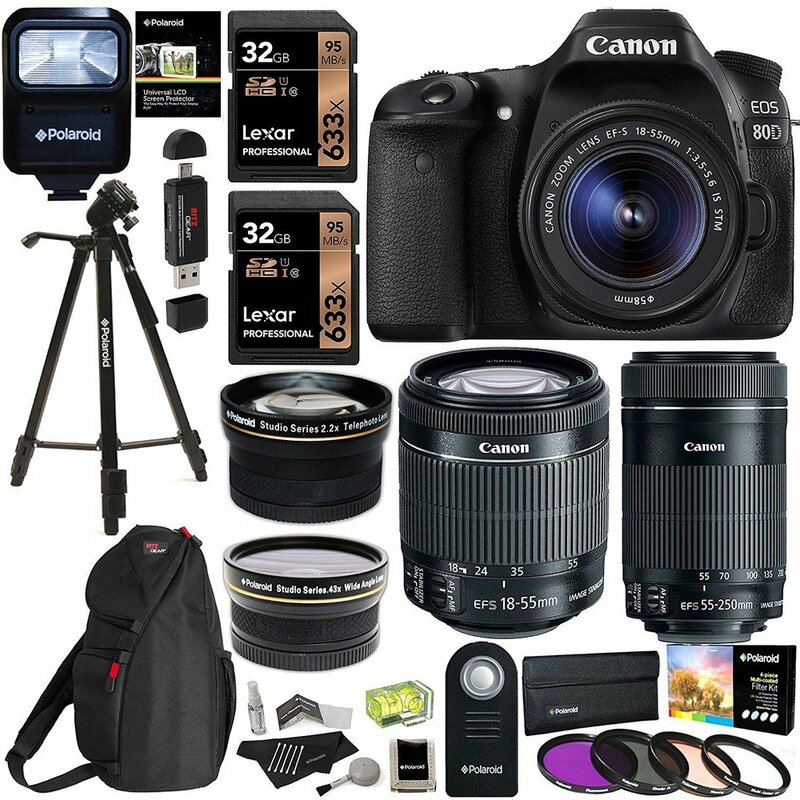 First and foremost, the bundle includes the Canon 80D body. Normally selling for $1,199 by itself, this is essential if you want to enjoy anything that the Canon 80D has to offer. I know, this information is obvious... but it needs to be said. It's also the most exciting part of the bundle, aside from the included lenses. Often referred to as a kit lens, the Canon EF-S 18–55mm is perfect for getting any photographer started. It's nothing fancy, but the lens is certainly capable of producing some truly remarkable shots — and don't let anyone tell you otherwise. If you understand the basics of composition, then there's no reason why you cannot use this lens to its full potential. The Canon EF-S 55–250mm is an excellent starter lens for photographers who are looking to zoom in on their subjects. And because this lens has built-in image stabilization, you can assure your shots (even when zoomed in) will come out sharp. You want to hear something crazy? I've gone through a variety of cameras in over 10 years of creating video content, but I've never actually owned an external flash. Thanks to this bundle, now I do. I may have a lot to learn in regards to using the flash correctly, but at least I have it in my possession. I'm looking forward to taking advantage of it the best I can. This travel kit from Polaroid includes two lens adapters that can be mounted to existing compatible lenses. Each adapter produces a different effect — one being wide-angle and the other being telephoto. Also included in the kit are attachments that can make lenses macro and infrared capable. This kit is intended to be used with 52mm and 55mm lenses. Polaroid's wireless shutter release does exactly what its name suggest. Pressing the button on the wireless remote allows you to shoot photos and videos with your Canon 80D without having to physically touch the camera. This can be very useful in a variety of situations, particularly time-lapses. Personally, I am not a fan of screen protectors, but many people are. And if you're one of them, then you will enjoy the fact that the bundle includes protection for the Canon 80D's display. Everyone needs a tripod, right? Of course! While the Polaroid PLTR150 isn't anything fancy, it can certainly get the job done. It's the perfect starter tripod to enable you to properly use the Canon 80D as soon as possible. It's a memory card wallet that holds a few SD cards. And it features the Polaroid logo. Simple as that. I'm not sure who makes this particular level, as there is no evidence of branding, but it's certainly nice that the bundle includes one. Slide the level into the shoe of the Canon 80D and you'll be shooting aligned photos and videos in no time. Why have one when you can have two? This Canon 80D bundle includes two Lexar Professional SD cards, each with a capacity of 32GB — totaling in 64GB of storage. Both cards are Class 10, meaning you will be able to shoot and record content quickly and effortlessly. As an owner of many SD/Micro SD card readers, I can say with confidence that this particular reader from Ritz Gear is quite impressive. Not only does it allow the connectivity of SD cards and Micro SD cards, but it's also compatible with devices that use Micro-USB. This is especially useful for importing media on tablets and smartphones. Proper protection for any DSLR is important, and that's why it is critical that you put your Canon 80D into a bag as soon as possible. This particular sling back from Ritz Gear isn't exactly my go-to choice, but it's better than nothing. If you want my personal opinion, check out any of the bags from Lowepro. I'm a longtime customer and wouldn't have it any other way. Note: This lens is not included in the bundle, but I did buy it for myself. Vloggers like myself need to pay attention to lenses like the Canon EF-S 55–250mm, because it features Canon's famous STM (Stepper Motor) technology. This means that the lens is capable of auto-focusing almost instantly and without causing any kind of distracting noise that DSLR users are used to hearing. If you enjoy recording video, then this is the lens for you. Finally, if you want to see all the above products for yourself, check out my Canon 80D bundle unboxing video right below. I'm looking forward to learning more about the Canon 80D and providing additional thoughts over time. Stay tuned!